The vacations of thousands of tourists were interrupted on August 21 when they were forced to evacuate resorts on the tip of the Kassandra Peninsula in north-central Greece because of a forest fire. Tourists and locals were forced to dash to the beaches as flames came down out of the hills toward hotels and residences, according to news reports from the BBC Website. Hundreds of people evacuated from the shoreline by boats. 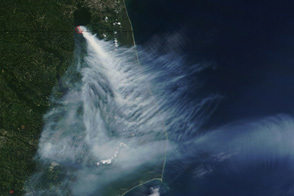 This image of the fire (location marked in red) was captured by the Moderate Resolution Imaging Spectroradiometer (MODIS) on NASA’s Terra satellite on August 22, 2006. 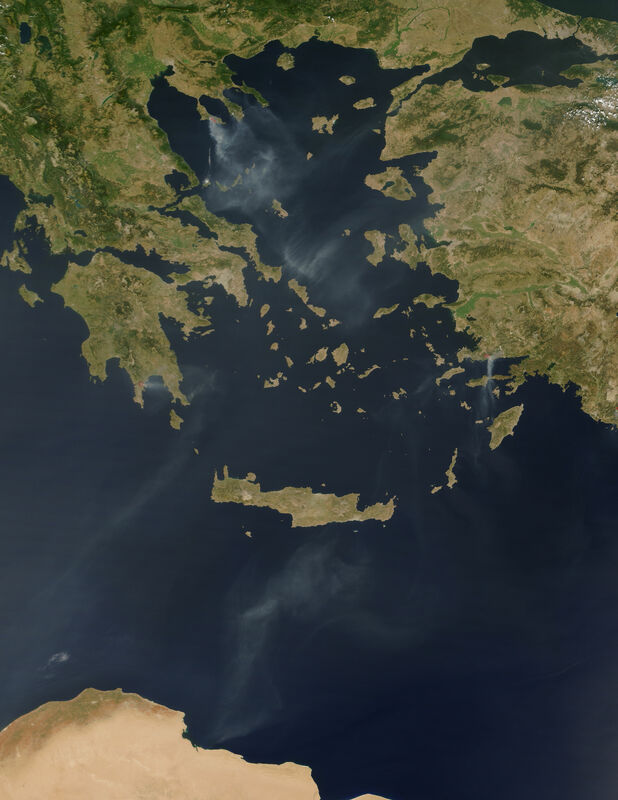 Smoke spreads south and east over the Aegean Sea. The fire was burning on the westernmost of three small peninsulas that extend off the Halkidiki Peninsula, south of the city of Thessaloniki. Temperatures in the region have been high (42 degrees Celsius, or 107 degrees Fahrenheit), and a seasonal north wind fanned the fire. 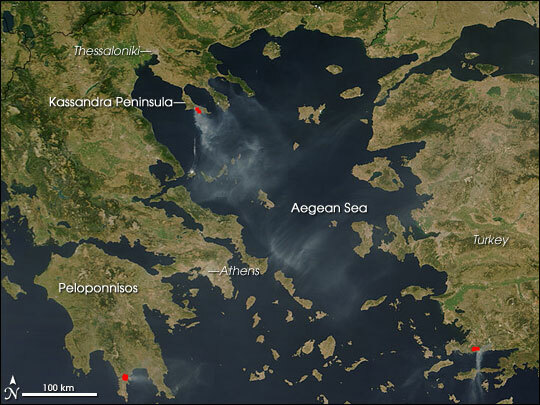 Other fires visible in the scene include one on the island of Peloponnisos, in southern Greece, and one in southwestern Turkey. The high-resolution image provided above has a spatial resolution of 250 meters per pixel. The MODIS Rapid Response System provides this image at additional resolutions.